← Inner Peace or Conflict? 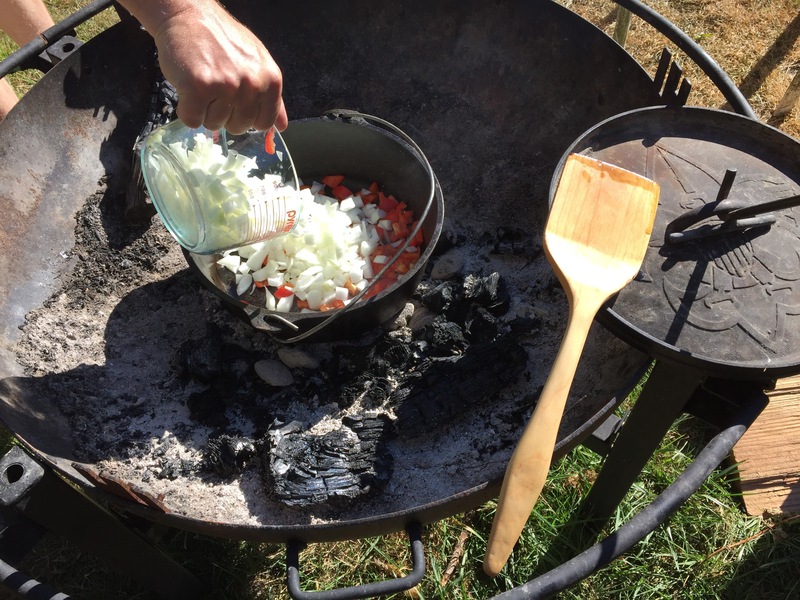 It gets hot in the summer, so I love cooking outdoors. Why heat up the oven and the house, when you can cook outside. I will look for any reason why we should make a night of being outside and cooking something good to eat. I love chicken chili because it is filling and healthy. I added some cornbread to the top because it pleases the crowd of hungry boys at the dinner table. Try this one pot dinner that is sure to please everyone in the family. The recipe is from the new Beachbody program called Shift Shop. 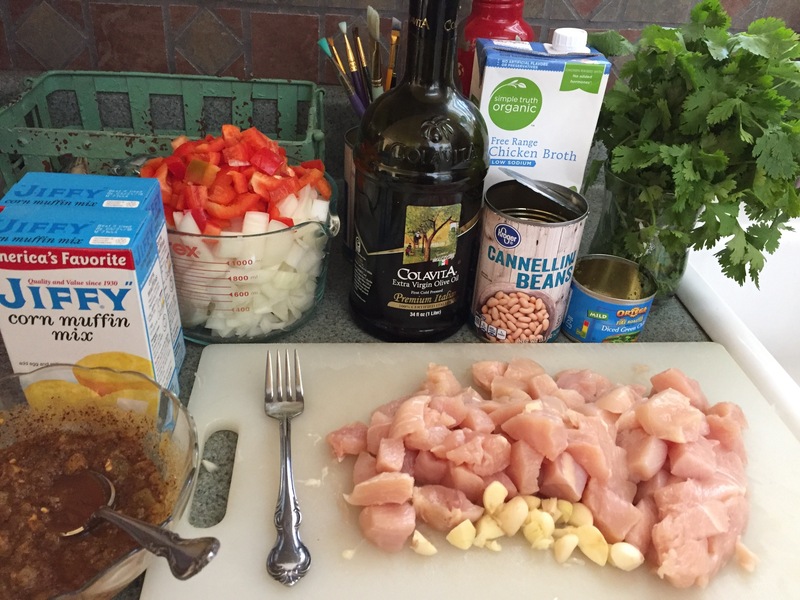 It is a fairly common chicken chili recipe…with cornbread on top. The cornbread is not Shift Shop approved! ​Step One: Gather all of your ingredients. I like to prep my ingredients inside, so cooking outside is easy peasy! Notice I mixed all of my spices with my can of diced chilies so that I wouldn’t have to carry all of the jars and measuring spoons outside! Ok, I lie, I had my 8 year old son mix the spices and chilies. He also opened the cans of beans and drained and rinsed them. Jobs like this are perfect for younger children. He felt special that he mixed all the flavor for our dinner. Conrbread: I love Jiffy corn muffin mix. It is easy and tastes great. I buy it in a six pack so I always have a box or two on hand. Jiffy mix calls for one egg and 1/3 cup milk. Step Two: Add a couple tablespoons of olive oil and get the Dutch Oven hot with charcoal. 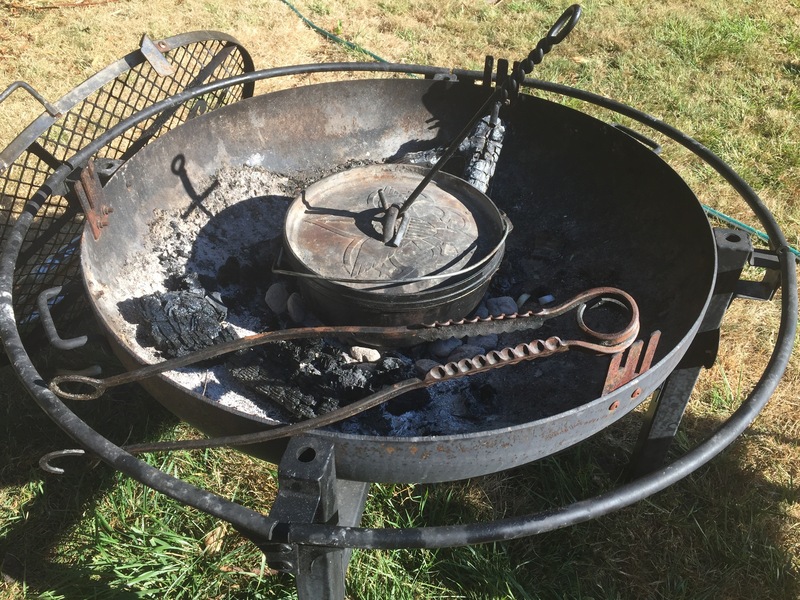 For cooking outdoors with charcoal, you need a Dutch Oven that has legs/feet and a lid with a lip, so charcoal ashes do not get into the pan when you open the lid. Click on the picture below to go to Amazon.com and see the Dutch Oven I use. Step Three: When oven is hot, add onion and red pepper. Cook until onion is translucent. Then add chicken and cook until chicken is white. Step Four: Add spices and chilie, add cannallini beans and add broth. Step Five: Move almost all of the charcoal to the top of the Dutch Oven. Then, wait for the chili to boil. You move most of the charcoal to the top to avoid burning your chili to the bottom of the pan. The thick metal will keep the food hot. It won’t take long for your chili to be ready. Step Six: Once your chili is boiling, add the corn muffin mix. There will be big blobs and little blobs. Some of the broth will seep up between your muffin mix and that is OK. It is important to make sure the chili is fully boiling before adding the muffin mix. If it isn’t boiling, the mix takes forever to cook. The box says 15-20 minutes in a muffin tin. It takes about 25 minutes when you are cooking the muffin mix over a liquid. Step Seven: Enjoy your one pot dinner. Garnish with fresh cilantro and sour cream. Thank you for reading this. I would love to hear a comment from you! 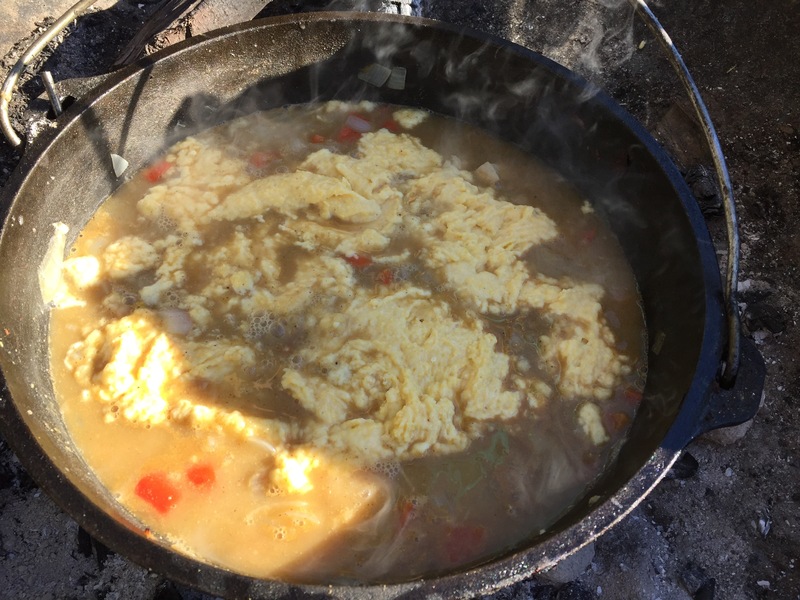 This entry was posted in Boy Scouts, Dutch Oven, Healthy Lifestyle, Recipes. Bookmark the permalink. I’ve always wanted to cook outside in a dutch oven! When my daughter was in Girl Scouts we cooked in box ovens, but this seems so much better! This looks great, I’m bookmarking it to try it out! I need a dutch oven!! I am not a chili fan, but this looks good. Great recipe! Easy to follow instructions! 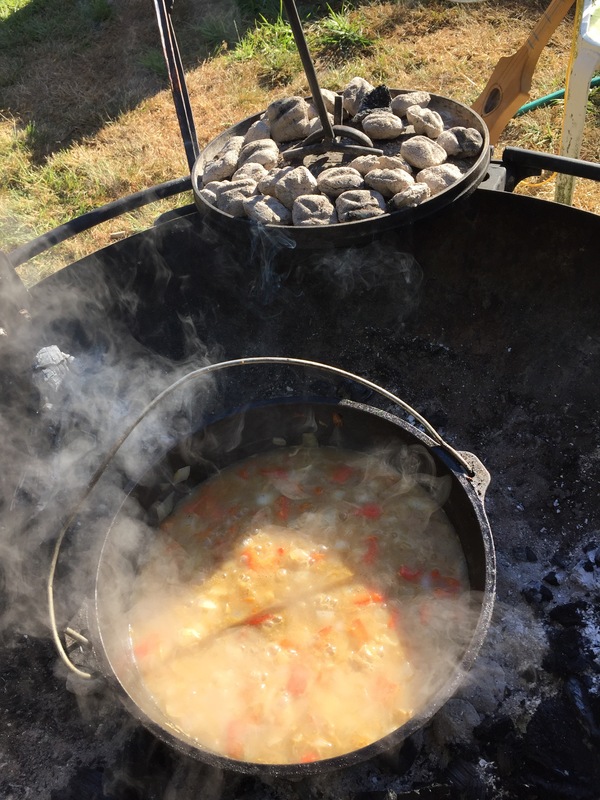 I never would’ve thought about using a Dutch oven and cooking outdoors at home! My kids would love that! 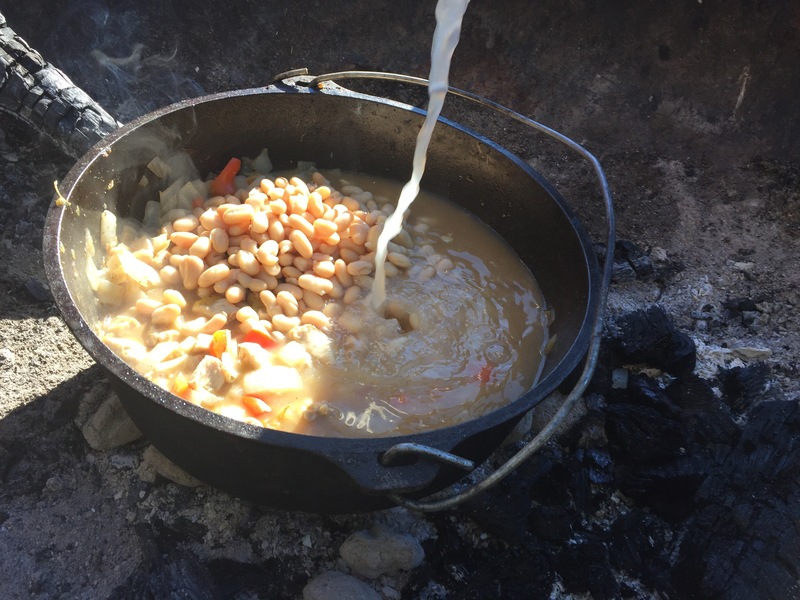 I love cooking with the dutch oven but haven’t been brave enough to do it on a camping trip! But I love this post and like all the pictures and good instructions…maybe I’ll just give a it a go when on our camping trip in a couple weeks! Thanks for sharing! This look great! I have more than one blog and easycrockery.com is where I would love to feature this blog post on, with your permission. Check it out and let me know if that’s okay. Of if you want to do swap blog posts. Hi Clarice. I am new to blogging and would love to swap blog posts. I might need some coaching on proper blog feature post etiquette.